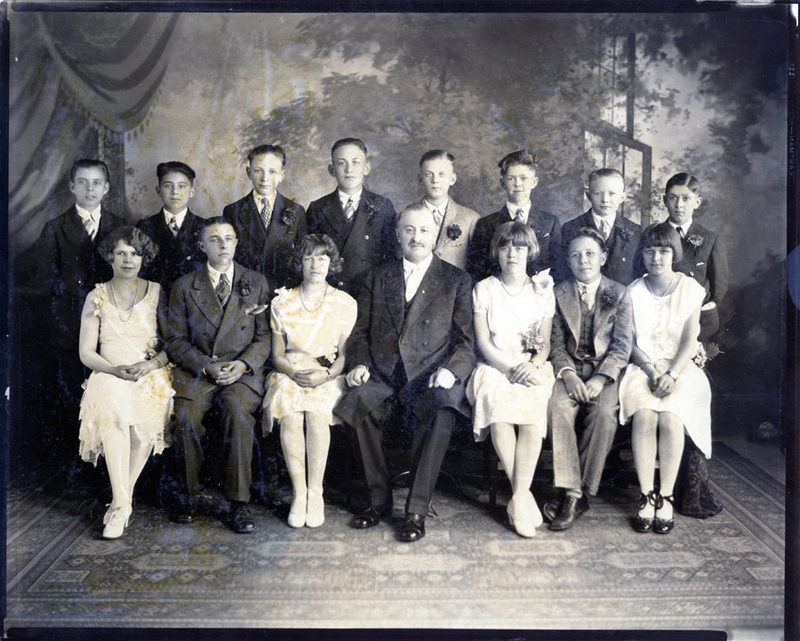 The Ebenezer German Congregational Church Confirmation Class of 1928. Front row: ?, ?, Emma Yuckert, Rev. Geo. H. Graf, ?, Alexander Miller, ? Back row: ?, ?, ?, ?, George Hamburg, ?, John Schleining, ? Unidentified members of the class include: Charles Weigandt, Henry G. Lehl, Henry Metzler, Walter Hoppe (Hopp), George Hohnstein, Ruben Schaefer (Schaffer), Lydia Miller, Esther Klaus, Mary Weber. Photograph and identification of John Schleining courtesy of Jerry Schleining. Tawnya (Schultz) Lege identified her great-uncle, George Hamburg. Alexander Miller identified by his niece, Valerie Miller. Krieger, Joanne, trans. Ebenezer Congregational Church, Portland, Oregon 1909-1984. Portland, OR: 2002. 227. Print. All names are shown as they are spelled in this source. Alternative spellings are shown in parenthesis. Last updated January 17, 2017.